Join our next Twitter chat with @WeddingWire, where we'll answer your questions about sweating for the wedding. Check in with @ACTIVE on Twitter with #ACTIVEchat at 2 p.m. CDT May 26. It may be hard to stick to a workout program with a specific goal date in mind if you have never done it before. Before you know it, your wedding day will be here, and you will want to be in the best shape possible. Staying motivated and keeping up with a routine can be difficult, especially when you add the stress of planning a wedding. Getting involved in some group workouts is a great way to stay on track. The social aspect helps people stay interested in a workout routine that could get boring if done on their own. Plus, many group workouts offer 30- to 45-minute time slots the same time each week, making it easy to fit into your schedule. Check out these eight classes that will get you into wedding day shape. 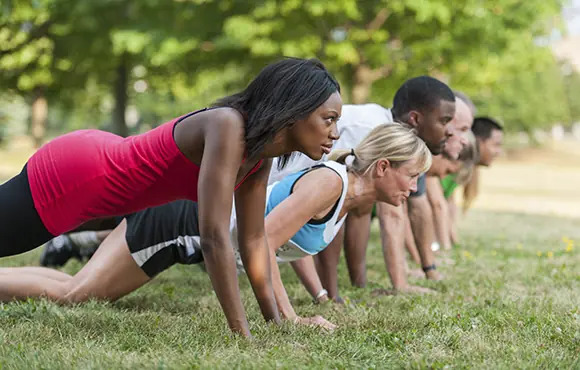 Boot camps are a great way to get total body toning mixed with cardio training. Classes feature sprint intervals, weight lifting, body weight exercises and calisthenics. All moves are high intensity to get your heart rate up and your body burning fat. A typical workout lasts about one hour and burns around 600 calories. Spin classes give you an intense cardio workout. Cycling uses large muscle groups in your legs, which help tone and shape your legs while you're burning a lot of calories. Maintaining your posture on the bike also helps build abs. A typical class lasts 45 minutes to an hour and burns roughly 500 calories. Yoga is the perfect way to get in a workout while also giving your mind a way to relieve the stress of wedding planning. Focusing on breath control and balance poses, yoga will sculpt your muscles and get your mind and body ready for your wedding. While there are many forms of yoga, a typical session lasts one hour and burns nearly 180 calories. Pilates is similar to yoga but tends to focus on the body's core. This low-impact workout focuses on form and flexibility. Done regularly, Pilates sculpts muscle and improves posture. A typical class lasts about one hour and burns around 250 calories. Dance classes provide a fun, fast-paced cardio workout and can even teach you moves to use at your wedding reception your wedding day dance floor. Classes range from hip-hop to Zumba and give you a high-intensity workout that incorporates body weight exercises like squats and lunges. A typical class lasts up to an hour and burns up to 650 calories. Running groups are a less expensive alternative to joining a group workout or having to pay for classes. Whether you want to start slowly or are looking to run longer distances, running groups provide a solid support system. Running can help you lose weight and strengthen your legs. A typical run for newer runners ranges from three to seven miles and burns 300 to 600 calories. A newer addition to workout classes, barre classes use a combination of ballet, yoga and Pilates exercises. The barre is a prop to balance on while doing isolated movements for strength training. Classes consist of holding your body still while contracting a specific muscle or doing high reps of a specific movement. A typical session lasts one hour and burns 300 to 600 calories. Focused on strength and high-intensity interval training, Crossfit uses a variety of workouts that feature compound movements to work out multiple muscle groups at a time. Crossfit is a great way to build muscle and blast fat. Sessions can be as short as 20 minutes, which will fit easily into your day. A quick 20-minute Crossfit workout can burn more than 250 calories.